Some have rubber matting covering the concrete floor, or may have bedding such as straw on top of the slatted floor to improve comfort. Some have individual spaces (freestalls) where cows can lie down. A strip of solid concrete along the outside lengths of the barn provides a feeding face and tractor lane. 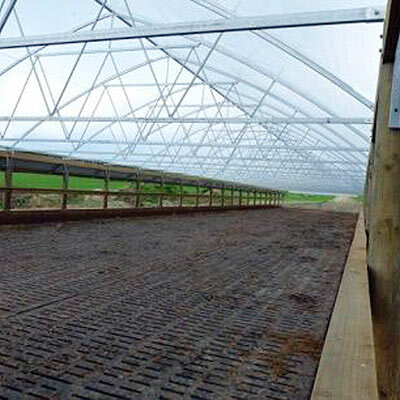 Loose housed barns combine a feed pad and an off-paddock wintering facility for use during wet periods, or in autumn to reduce urine deposition on paddocks. Better herd monitoring may be possible, e.g. heat detection, animal welfare, BCS. Unless concrete has rubber matting not suited to long periods of use. Lameness can increase on slatted concrete. Supplementary feed costs typically greater than pasture. Location in relation to herd access - close to dairy (milking shed) is convenient but also dependent on location of feed storage areas and facilities intended use. Roofed structures require structural engineering to take in to account wind, snowfalls, etc. Feed supply management plan – what is grown on farm/support blocks versus what is imported. Access to grain, silage and ability to feed with least traffic movements. Must provide correct stocking density (3.5-4.0m2/cow) and feed face space per cow. Stocking density of 3-4.5m2/cow only when used as feedpad. Recommend that at this density it is used for less than 8 hours per day. Minimum 9m2/cow with additional soft bedding required for 24/7 use over extended periods of time (several days eg during winter). 9-11m2/cow required for more than 8 hours per day use over several days doubles the cost. Case studies and analysis indicate that once built, many farmers increase cows and levels of supplementary feeding. Costs of feeding supplements is typically 1.5x purchase cost of feed per kg. Size and usage will dictate cleaning frequency. Dave and Clare Beuth from Mamaku, Bay of Plenty, were seeking improved winter stand-off options for their herd. Read about the process they went through and the decisions they made in this case study. Stu Parker from Oxford, Canterbury decided on a Herd Home to run his split calving system. Read about his key learnings and his advice to others in this case study.